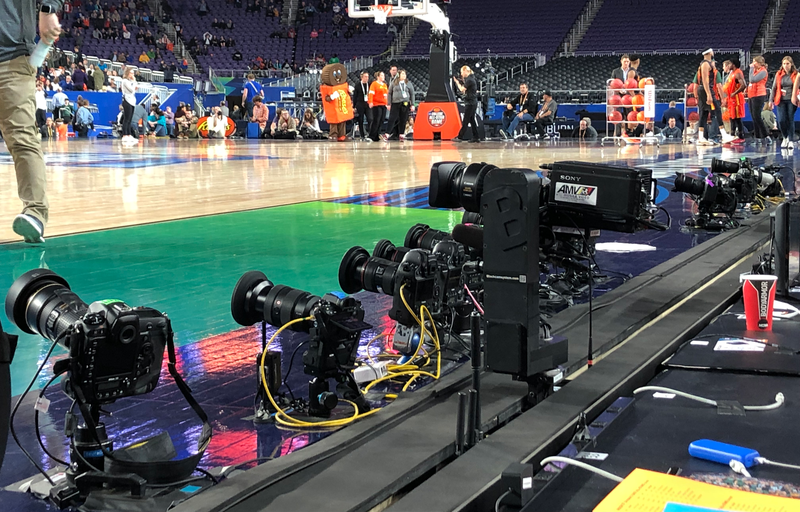 Its business as usual at the NCAA Men’s Basketball Final Four for the production and operations teams of CBS Sports and Turner Sports. And while that may sound routine, its anything but. This year’s event in Minneapolis is another massive video operation with two full production compounds (one inside the bowels of U.S. Bank Stadium and another outside in a parking lot), more than 50 cameras in the bowl of the stadium, and more than 400 CBS staffers alone on site to pull everything together. This year’s NCAA Men’s Basketball Final Four will again be produced by the combined teams of CBS Sports and Turner Sports. Power admits that, for those who follow the production of the Final Four, there’s not much that’s “new” technologically. There are fun production staples that have become expected at an event like this, including a SkyCam and RailCam, a robotic camera that slides on a track on the floor along the near sideline. There’s also been a new set of robos installed on the baskets behind the glass of the backboards to add an extra, unique look. Thirty five cameras in the stadium will work the game coverage while another 13 are dedicated to studio programming. CBS and Turner have two different sets, each in the student sections behind each of the baskets that will serve as home for pregame and halftime coverage throughout Saturday and Monday evening. 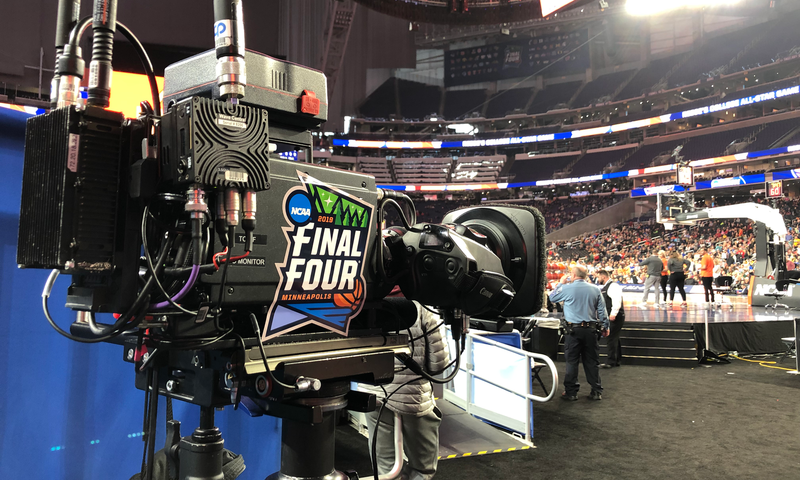 RailCam, a robotic camera that sweeps across the floor of the near sideline on a track, has become a fixture at the Final Four in recent years. It’s ready to go, again, for this weekend’s show. The biggest challenges of this year’s venue are lighting and finding the right camera angles in such a massive bowl for basketball. A lot of work went into the blacking out of open glass features of the stadium, including on the roof and along the front entrance gates. Last year’s Final Four at the Alamodome served as a much more intimate atmosphere for basketball, in comparison, so much of the prep in the days leading up to tip off this year have been dedicated to calibrating cameras and juggling positions to get the most ideal angles for a basketball television broadcast in a non-basketball facility. Down inside the main production compound, Game Creek Video’s 79 is the primary game support vehicle, while NEP’s Supershooter 22 will run studio shoulder programming. A pair of sets, including this primary position on the stadium’s west end, were built in each of the student sections behind each of the baskets. These sets are overseen by Turner crews and are run from NEP Supershooter 22 in the main production compound. In terms of responsibilities, its similar to previous years with (largely) CBS technicians overseeing the game production while Turner staff focuses on the studio programming and other digital and social efforts, like the VR shows (being handled through Intel Sports). Beyond the traditional game coverage, Turner Sports has enjoyed another wildly successful year supporting much of the digital and social execution of March Madness. 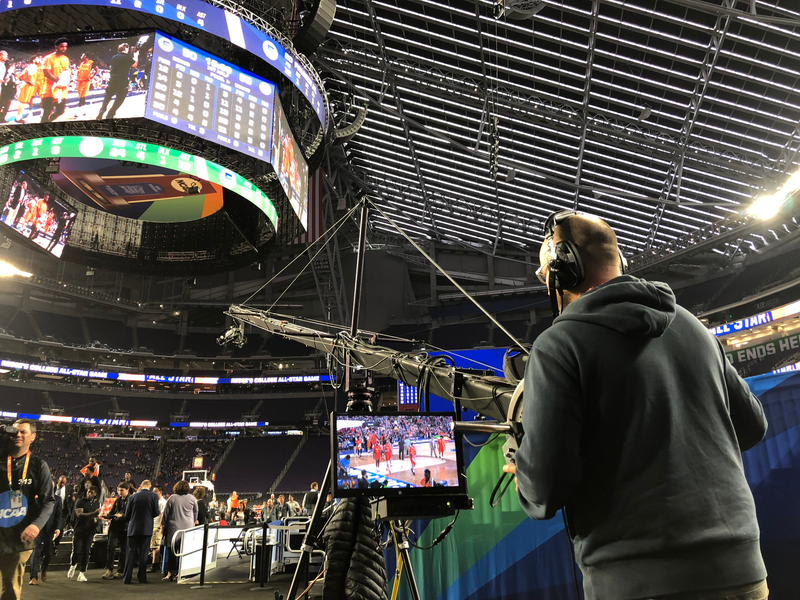 The popular NCAA March Madness Live streaming suite of products has delivered a deeper experience and more offerings than ever before and has seen record-setting usage at this tournament to date. In addition, Turner’s social media talent manages the official NCAA March Madness social accounts across Twitter, Facebook and Instagram. Those have seen huge year-over-year growth in engagement throughout the Tournament. “The Turner operations piece is a very easy fit for the two of us,” says Power, who credited VP, Operations and Engineering Tom Sahara and Director of Technical Operations Chris Brown from the Turner side for their tremendous efforts. For CBS Sports, VP, Remote Engineering and Planning Mike Francis and VP, Remote Technical Operations Jason Cohen have also played a key role behind-the-scenes on this year’s tech ops. Cohen, a veteran of the industry and a long-time production and ops exec at HBO Sports is working his second March Madness season while being on-site for his first Final Four. As in previous years, a large jib sits in one of the corners of the bowl, providing sweeping shots of the court and the student sections on its side. The producer-director tandem of Mark Wolff and Bob Fishman continue to add to their outstanding legacy. For “Fish” (as those within the company refer to him), this is the 37th Final Four in which he has served as lead director. 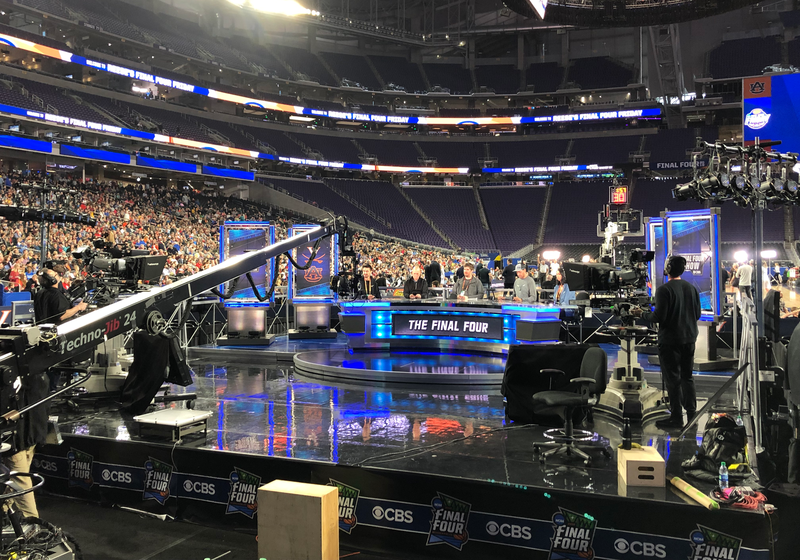 In addition to all of the action at U.S. Bank Stadium, CBS has also brought its CBS Sports Network out in force with an impressive pair of sets in Downtown Minneapolis at the IDS Center (which also happens to be the tallest building in the entire state of Minnesota). 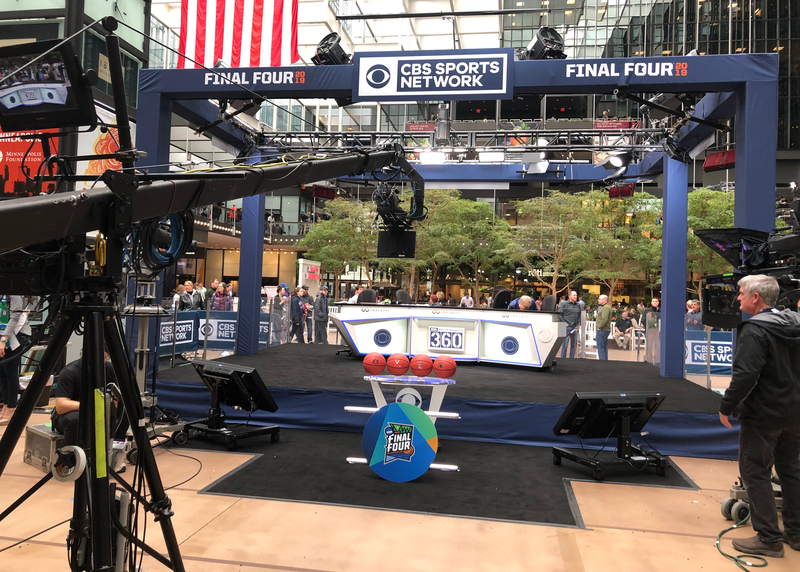 CBS Sports Network has two sets in Downtown Minneapolis at the IDS Center that will be used for studio programming on the cable network. The main set is actually in the exact same position that ESPN used for its on-site studio coverage of Super Bowl LII when that was in town last winter. The atrium of the building serves as an indoor courtyard of sorts and has proven to be a draw for visiting fans and locals alike to come see some television magic in the flesh. In addition to that stage, there’s a demo area just outside the front doors of the IDS Center on Nicollet Avenue where there’s a demo court with additional cameras and lighting. All in all, there are six cameras on these sets, including a big jib on the main set. The entire IDS Center activation is supported by a pair of F&F Productions vehicles and is connected back with the main compounds over at U.S. Bank Stadium. Additionally, there’s satellite transmission support being provided by the home town crew from ARCTEK. Elsewhere in town, Turner Live Events has also supported the production and execution of the NCAA March Madness Music Series. Fans are being treated to three nights worth of shows at The Armory in Minneapolis; the AT&T Block Party on Friday, April 5, headlined by the Chainsmokers, followed by Coca-Cola Music on Saturday, April 6, headlined by the Jonas Brothers, and concluding with Katy Perry headlining the Capital One JamFest on Sunday, April 7.